OROFLEX™ Bandama is an extruded PVC/Nitrile hose with circular woven polyester/nylon reinforcement that provides superior kink resistance at low pressures. Its special NBR rubber compound resists UV penetration and weathering. Bandama has very low elongation properties that impede snaking and twisting. The ribbed cover provides high resistance to oil, weathering and abrasion. The hose’s lighter weight makes it easier to store than most rubber discharge hoses. 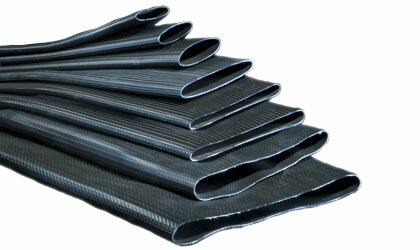 Hose is manufactured in special longer lengths (660 ft.) to reduce leak points. Click here for more info.